Coalition airstrikes continued its trend of fewer bomb drops in Afghanistan, with 190 total for the month of October, down 42 from the month before. 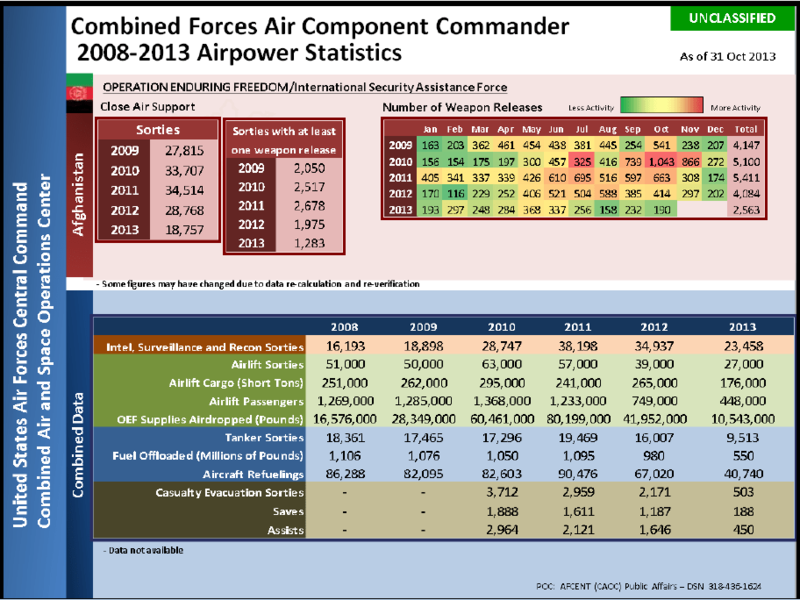 So far in 2013, there have been 1,283 total sorties with at least one weapons release, according to statistics released today by Air Forces Central Command. This compares to 1,975 total for last year. Other assets have remained busy. In October, there have been 23,458 total intelligence, surveillance and reconnaissance sorties, and 27,000 airlift sorties, which included 176,000 short tons of cargo and 448,000 passengers. Casualty evacuation sorties have remained low throughout the year, with a total of 503 so far in 2013 compared to 2,171 for all of last year. The 2013 numbers include 188 saves and 450 assists. The full breakdown is available below.